One cause of email overload is being a slave to email at the expense of other communications media. 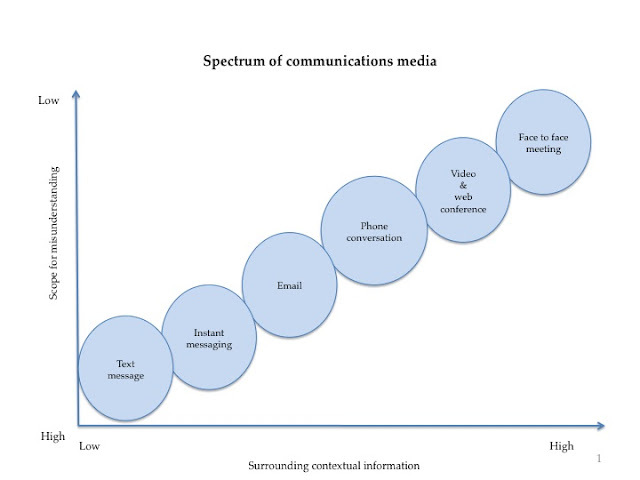 As Peter Drucker once said ‘the new information technology… Internet and e-mail… have practically eliminated the physical costs of communications.’ But is this at the expense of the quality of communications? When was the last time you talked rather than emailed someone? Email is just one of a glittering array of communications media which range from Facebook, text and instant messaging to old fashioned talking be it either face-to-face or through Skype. After text and IM, email carries the least ammount of contextual information. You have no idea whether I am crying or laughing. Some would argue that you can add emotions with emoticons. But these too can be misinterpreted and most business people regard them as unprofessional and sloppy. A conversation is very often worth nine rounds of email ping-pong at the end of which the matter is probably still unresolved. Indeed, using an alternative communications channel can be a very effective way of reducing email overload. Performance related challenges, for example why did a supplier let you down, why did a team member not perform as expected. Simple quick transient messages which need your immediate attention (if you are present) and which do not need to be recorded and have no value after five minutes eg visitor in reception, fire alarm being tested. Scheduling a meeting with several people – far quicker using a proper meeting scheduler than by email ping-pong. Why are we so locked into email? Is it cultural, personality related (eg introverts find email easier than talking). Is it generational (there evidence that Generation Y pefer social media to email)? To check just how addicted you are to email use our Email Addiction benchmarking tool. This week’s tips on how to reduce email overload are focused on choosing an alternative to email to ensure that you convey the right message right first time. Meanwhile, I’d love to hear your opinion on why you feel we are so addicted to email which drives up email overload and also when you have found an alternative to email more effective.